DU LLB Entrance Exam. The section of Maths plays an important role in Law Entrance Exams. You must be in need of Maths preparation tips to perform better in upcoming CLAT Exam. It is not a necessity to mug up everything in maths to crack CLAT exam, you just need a smart strategy to crack CLAT. Even if we are weak in Maths then too we can frame some strategy to overcome Maths phobia and to perform better. Let us first look at a comparative analysis of CLAT, AILET and DU LLB Maths sections before moving on to some important tips which will make you score. *One must note that whereas CLAT, and AILET Math sections are entirely Maths based but the 140 marks of Math is a case of the DU LLB exam also consist of marks for Logic-based questions. This means that the 140 marks of DU LLB Math mentioned above are inclusive of Logical Reasoning. Follow these Preparation Tips for Law Entrance Exam and ace your score in Math section of CLAT and DULLB Exam. The preparation book which I recommend for the law entrance exams is RS Aggarwal. It more than suffices, is designed for law entrances and you need not look beyond this book because it covers everything. If you absolutely must miss some topics from this book then you could practice only the following topics. The other thing which becomes very important to do as part of AILET preparation tips especially is solving past year papers. Questions are often picked up from these papers with just the digits changed. Next, appear for a mock to see how far ahead your progress is. Take a couple more CLAT Mock Test, and solve the whole Maths section in 15 minutes. Learn from the mistakes till you are sure that you will not repeat the same mistake in the exam. Study partners help. If you are not adept at Maths and your partner needs help with legal reasoning then studying and solving the doubts of each other can make you an expert in both subjects. Plus, when you teach someone something then that adds to your preparation in a big way as well. VII) Learn the formulae but absolutely do not mug up concepts. Concepts have to be understood and not learned by rote. VIII) Let us also eliminate the negative marking situation. This is an important aspect of CLAT preparation tips. In Maths it is easy to know when your answer is right and when it is not, therefore, answer the question when you are sure. If the calculation you do makes you arrive at an answer which is close to one of the choices given then mark that choice. If you are unsure even after this then, by all means, join coaching, attend classes religiously and ask teachers to solve all your doubts as unsolved doubts create panic. Ask your teachers for shortcuts which are easy to fathom and to apply. This will help you save time. Sometimes certain questions are best solved by using the answer choices in the calculation. For example, if you need to find the total amount of money with a person initially with details given of the money being spent on certain different things then start by assuming every answer choice to be correct and you will get to know which options are wrong and what the correct answer is. At other times you have to form a linear equation. For example, when you need to find the total number of notes in different denominations present in one sum of money. So, if the notes of Rs.2, Rs. 5 and Rs. 10 are present in the ratio 5: 8: 10 and the total money is Rs. 4000 then the equation becomes Rs. 2*5 x + Rs. 5* 8 x+ Rs. 10* 10 x= Rs. 4000 which means 10x +40x+100 x= 4000 or 150 x= 4000. Now you can easily find the number of notes of each denomination. You will learn these and other tricks when you go for coaching, and you will learn that there is a trick for every type of question. There is nothing more interesting than Maths once you get over your fear of the subject. So, all the best and may Maths be your score booster. 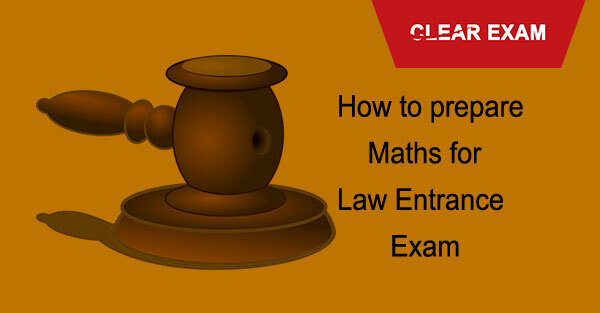 Read the preparation tips to fetch high score in maths section of Law Entrance Exams.